This quick start guide will guide you through the process of installing ajax live search on your website. Ajax Live Search comes in 2 versions, the lite version and the pro version. Visit the features page to compare them. The lite version is free while the pro version goes for $59 $29. To install the lite version, log into your WordPress dashboard page and click on the plugins tab then click on add new. On the page that comes up, there is a search box that you can use to search for a given plugin. Type in 'Ajax Live Search' and click search. Have a look at the results and click on install when you spot one that has picocodes as the author. WordPress will then automatically install Ajax Live Search for you and you can start customising it to suite your site. Alternatively, download the plugin then install it as follows. Use the form to upload the zip archive that you downloaded above. WordPress will automatically install ajax live search for you after you click activate. If you need extra functionality and speed boosts, then installing the premium version is the option. First, buy a license securely using PayPal or your credit card. You will then be emailed a download link that you can use to download the plugin and then install it as follows. If you have an active copy of the lite version, please deactivate it first because it shares some of the classes as the pro version. Your search logs won't be lost. You can use any of the following modifiers when searching. + A leading plus sign indicates that this word must be present in the found result. - A leading minus sign indicates that this word must not be present in the found result. > Indicates that this word should be given more weight. ~ Indicates that this words weight should be negated but not removed. See 2 above. * When you append an asterisk to a word; we match all words beginning with the value before the asterisk.
"" Returns results that contain the phrase in the parenthesis and in the same order. author_in: Comma separated Ids of authors whose posts should be searched. author: or @ The username of an author whose posts should be searched. author_not_in: Comma separated Ids of authors whose posts should be excluded. category: Comma, "-" or "+" separated list of category slugs to search in. Use comma to get posts from any of the categories. Use "+" to fetch posts that appear in all categories. Use "-" to exclude posts from the given category. tagged: Comma or "+" separated list of tag slugs to search in. Use comma to get posts with any of those tags. Use "+" to fetch posts that have all those tags. post_types: comma separated list of post types to search. The post types given should be the same as those stated in your settings page as searchable. before: An english date format to use, e.g, last week, 2 months ago, January 1st, 2013 etc. Enclose in quotes. This query returns posts published before the given date. Changing how search results are ranked. You can assign weights to different post types and fields such as post titles and comments. For example, you can assign more weight to the products post type to boost the ranking of products in the search results page. Ajax Live Search comes in a ready to use mode. It is compatible with most themes since it uses the active theme's styles to maintain the theme's look. However, it comes with it's own search template and also adds it's own styles to the search forms on your website. If your theme does not follow the WordPress theme development guidlines, this might break things a little (in terms of styling). You should therefore visit the homepage and try to search and see how the suggestions appear. You can also click on one suggestion or click on submit and take a look at how the search page appears. If you don't like how it feels, or would just like to give it a personal touch, then visit the plugin editor in your dashboard and click on ajax live search; then click on style.css to edit it. after customising the frontend, head over to the settings tab to customise what appears in your front page; by enabling and disabling certain features. The settings page has 3 tabs; general, searching and result pages. Currently, the only thing that you can change in the general settings tab is toggling caching on and off. You can also use this page to index more posts by clicking on the index more tab. 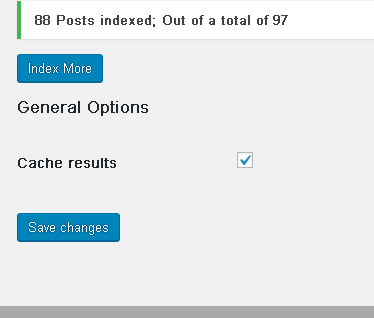 This tab is used to change how the plugin indexes and searches through posts and pages. To learn more about these features; please visit the features page and take a look at how they work. Use this tab to tell ajax live search what and what not to show on the search pages and how to show it. Ajax search let's you add sponsored results so that they can be displayed on top of search results when a user submits a relevant query. In your dashboard, point your cursor to ajax live search and then click on sponsored results. You will see a list of all the sponsored results that you have added. Click on add new to create a new sponsored result. You will be able to fill a form with the title, description, tags and link of your sponsored result. Your sponsored result will be shown at the top of the search results whenever it matches a search term. You can toggle this on/off in the settings tab. 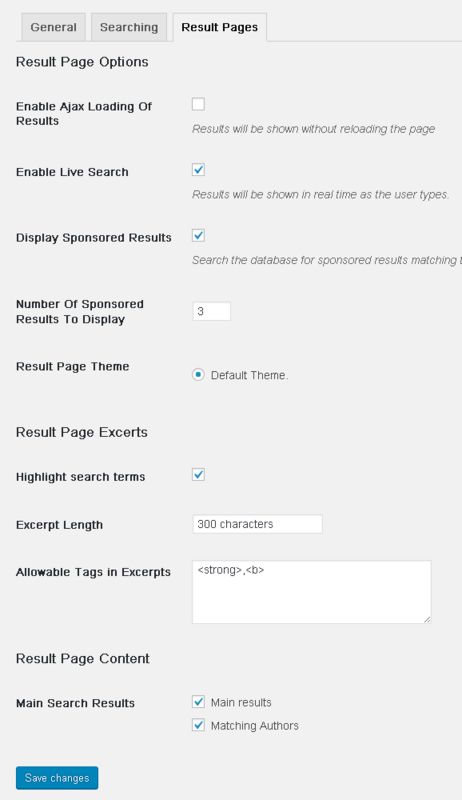 You will also have a chance to specify the number of sponsored results to show in a search query. Ajax Live Search saves search queries so that you can analyse them later. You have the option of viewing the statistics as a table or in form of graphs. These statistics are especially good when searching for new content ideas. If you have the pro version, you can also import the statistics as a csv file and analyse them offline in your favourite spreadsheet. If no searches have been made and you need to test it out, just click on the generate dummy data button and the plugin will create some dummy content for you to play with. To view these statistics; in your dashboard, click on the statistics tab of the ajax Live search menu. Here, you can toggle between graphs and tables and also generate dummy data or download it as a csv document. 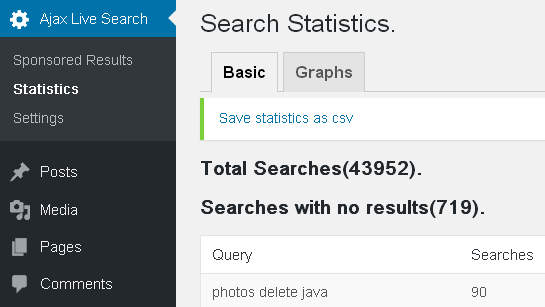 By now ajax live search should be up and running properly. If you need to customise it even further, then make sure to check out the developer's quickstart guide.